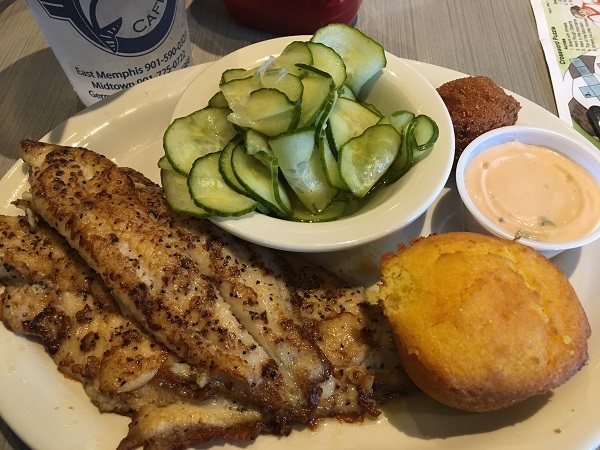 Soul Fish Cafe, Memphis TN – Marie, Let's Eat! Observing Lent, Marie’s brother had asked us to pick a restaurant for dinner on the Friday of our trip where he could order fish. One recommendation stood head and shoulders over everything else in town. 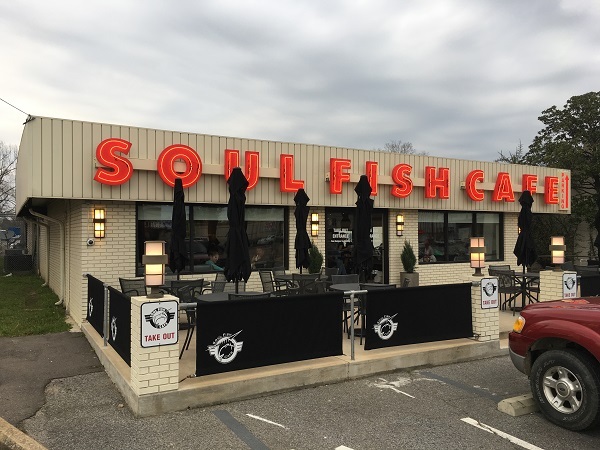 Soul Fish Cafe opened its first store on Cooper Street in 2006. It’s grown to three locations around Memphis and a fourth in Little Rock AR. I suggested that we meet up at the store on Poplar Avenue, because I had a good feeling we’d have more parking available there. We all arrived just in the nick of time. This place is hugely popular, especially on Friday evenings. We got the last available table, and the crowd that built up behind us had a very long wait ahead of them. Marie and Karl each ordered trout and were very happy with them. She got the rainbow trout, and he picked red trout, which was a special that evening. I took a break from my usual rule about seafood restaurants there. The daily specials will often be much tastier than what’s on the regular menu. 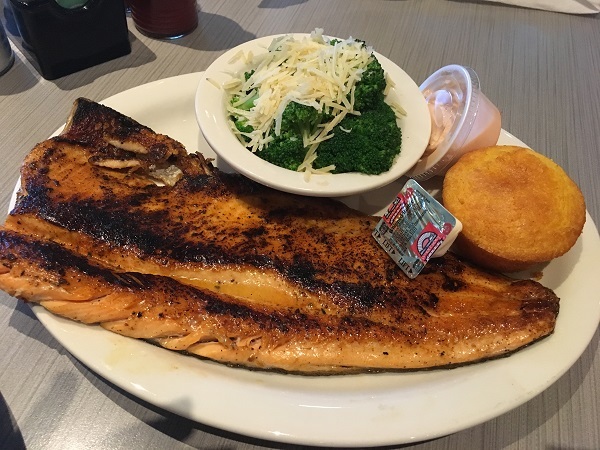 The restaurant is known for its catfish, and so that’s what I ordered. Our server recommended that we order our entrees lightly blackened rather than fried. I’m really glad that I went with the server’s suggestion, because this was really delicious. I enjoyed this very much. We were all pleased with our choices and nobody had the dreaded menu envy. Even our son was really happy with his catfish “bites” from the kids’ menu. He may veer toward the bland side of most menus and enjoy ketchup even more than I did as a kid, but we’re really pleased that he is willing to try fish and vegetables. It bodes well, him going that way and not, say, to grilled cheese sandwiches or plain bagels. We didn’t linger after enjoying our meals, because this place was completely packed and there was a line out the door. I do feel kind of strongly about not hogging a table during peak times; servers want to turn those tables over and deserve good tips. Karl very generously paid for our meals and we split up outside. Just down the street, I’d noticed there was a comic shop called Comics & Collectibles I wanted to look at, and I’m glad that we did. This is an absolutely splendid shop, by far the best we’ve found in Memphis, and, frankly, better than any here in ‘nooga. I found several things that I wanted but couldn’t really justify – my mad money had gone to Bryan Ferry’s Atlanta concert earlier in the week, meaning I’ll have to get that new Harvey Kurtzman collection some other time – but Marie picked up a Phil Foglio book and we left with this place on our to-shop list for the next time we’re in town. 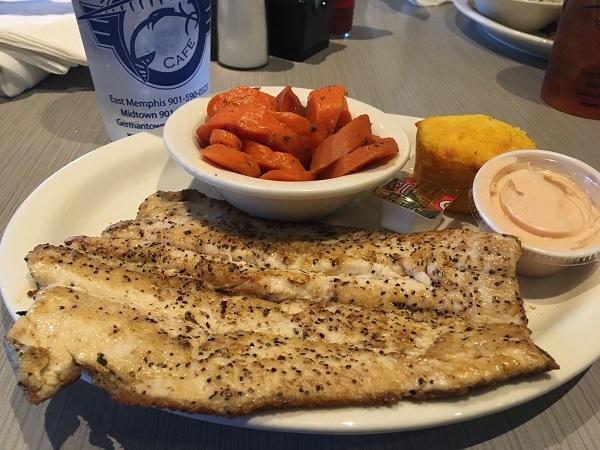 Posted on May 17, 2017 by Grant G.Posted in memphis, regional chains, seafood, tennesseeTagged memphis, regional chains, seafood, tennessee.